Why send a Christmas card that your customers will throw away after the holiday season when you can send them a greeting card that can be planted to grow a beautiful assortment of annual and perennial wildflowers to remind them of you? 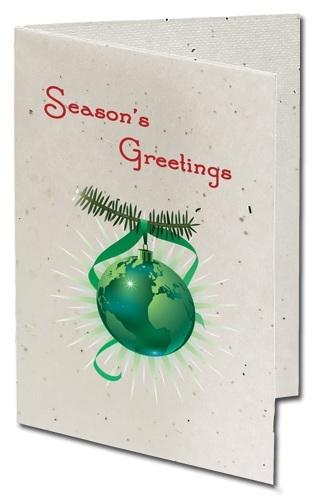 Now you can send them an environmental-friendly Seeded Paper Christmas Holiday Cards. Or if you would simply like something different to include in your mailings for no extra postage expense, consider our Seeded Paper Christmas Ornaments. 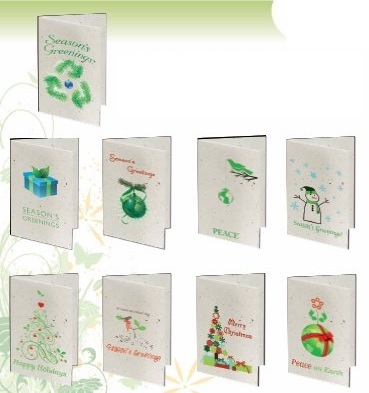 Create your Christmas design to print on recycled paper embedded with seeds. Plant card to grow wildflowers after the holidays are over. Envelopes included. Insert your business card or customize your message inside (additional charges apply). A great way to make the Christmas season and winter holidays "green". Price includes holiday card with full color custum imprint on outside with blank inside printed on seeded paper and envelope. Cards are packed 25 per box with 26 envelopes included. Seeded Paper Holiday Cards, Item #AG335100 - Price includes seeded card with full-color imprint on outside (blank inside) and envelope.